Author(s) Aikhenvald, Alexandra Y.; Dixon, R. M. W.
Linguistic typology identifies both how languages vary and what they all have in common. This Handbook provides a state-of-the art survey of the aims and methods of linguistic typology, and the conclusions we can draw from them. Part I covers phonological typology, morphological typology, sociolinguistic typology and the relationships between typology, historical linguistics and grammaticalization. It also addresses typological features of mixed languages, creole languages, sign languages and secret languages. Part II features contributions on the typology of morphological processes, noun categorization devices, negation, frustrative modality, logophoricity, switch reference and motion events. Finally, Part III focuses on typological profiles of the mainland South Asia area, Australia, Quechuan and Aymaran, Eskimo-Aleut, Iroquoian, the Kampa subgroup of Arawak, Omotic, Semitic, Dravidian, the Oceanic subgroup of Austronesian and the Awuyu-Ndumut family (in West Papua). 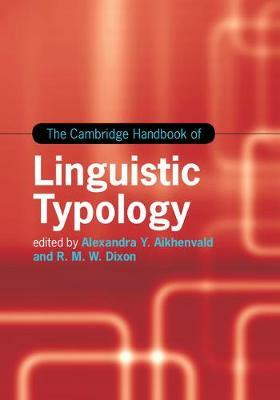 Uniting the expertise of a stellar selection of scholars, this Handbook highlights linguistic typology as a major discipline within the field of linguistics.